October 16, 2013 - Make sure you like EcoJoes on Facebook to stay updated on green ways to save money and help the environment. Just click the "like" button below. Muchas gracias! Also, like any mulch, it helps keep the ground under it from drying out, meaning less water is used keeping plants watered. One thing they stress is that their shell mulch is fire retardant (unlike lots of other wood-based mulches). Why do they stress this? Well, legend has it that before founding Colored Shell Mulch in April 2007, Jim Bisgrove’s house caught on fire after an errant cigar landed in nearby mulch. His house (and anger, no doubt), thus incensed, he founded this company to provide an eco-friendly, fireproof mulch. 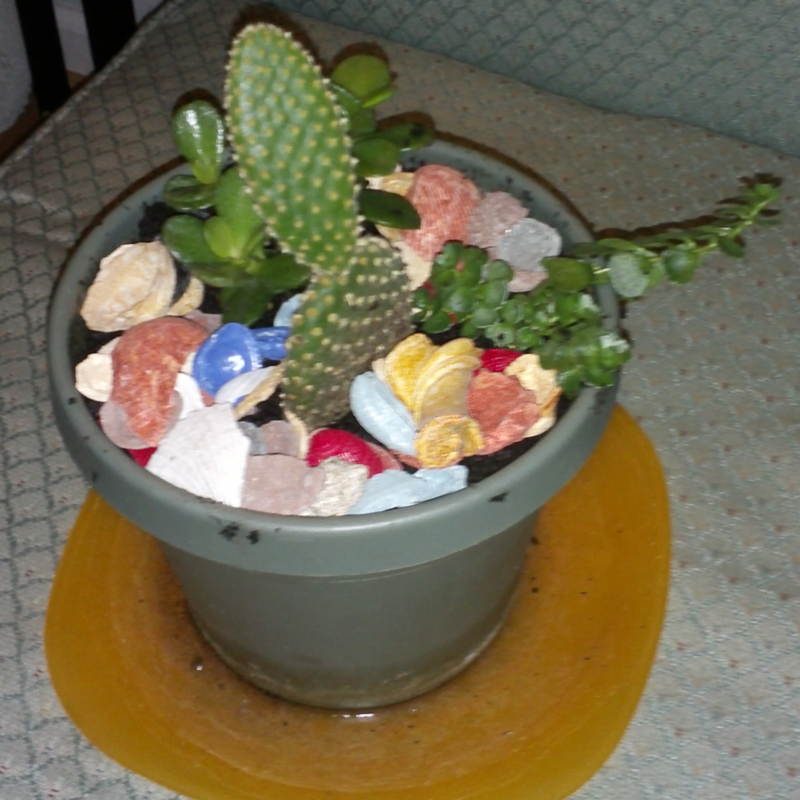 Inspired by Jim’s heroic story of literally rising from the ashes, I created a small desert biome (with the help of my shell mulch) to grace my window. In a fit of artistry, I made sure this photo was not quite focused. So if you’re looking for a colorful, flame-proof alternative to normal ol’ mulch, hop into the information superhighway and take a trip over to their website (which is under construction at the moment). We never kill animals for their shells!! All of our shells are fossilized and are a by-product of quarries. We then wash them and then color them. We are essentially reusing a “garbage” by-product of mines and quarries all throughout Florida. Posted in gardening, plants	on Wednesday, October 16th, 2013 at 7:42 PM. My mame is Karen and i own coloredshells.com No creatures are ever harmed from our products. We are using fossilized shells that are a by product of quarry’s and we wash them and them color them. I am an animal lover myself. That's what I'm talking about, Karen. Good job finding a good use for a quarry's waste. Are these really fossil shells? They seemed like normal shells to me. 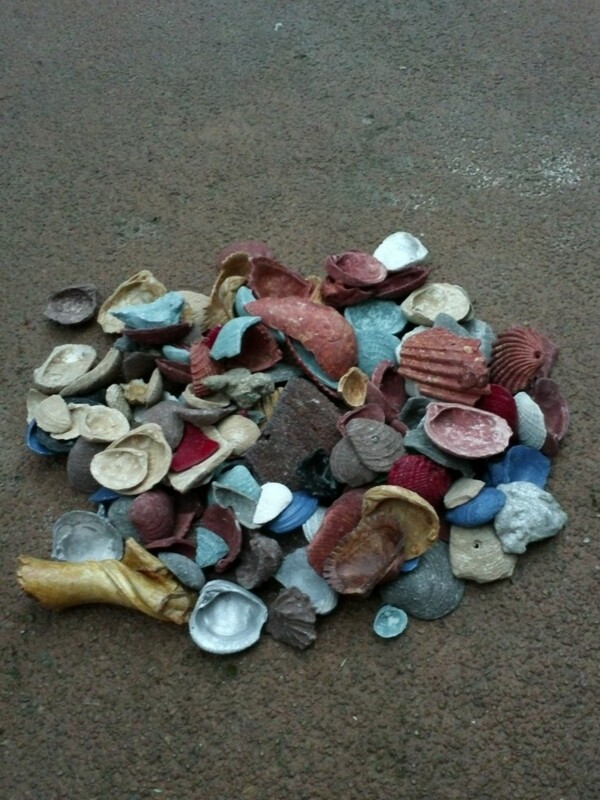 Yes….. All of our shells are truly fossilized!! They are millions of years old.